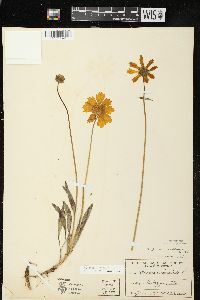 Perennials, 10-30(-60+) cm. Aerial nodes proximal to first peduncle usually 1-3(-5+), distalmost 1-3 internodes 1-2(-8+) cm. Leaves: basal and cauline on proximal 1/4-1/3(-1/2) of plant heights; petioles 1-5(-8+) cm; blades simple or with 1-2+ lateral lobes, simple blades or terminal lobes lance-ovate or lanceolate to oblanceolate or lance-linear, 5-12 cm × 8-15(-18+) mm. Peduncles (8-)12-20(-35+) cm. Calyculi of lance-ovate to lance-linear or linear bractlets 4-8(-12) mm. 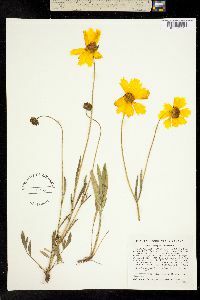 Phyllaries deltate to lance-deltate, 8-12+ mm. Ray laminae yellow, 15-30+ mm. Disc corollas 6-7.5 mm, apices yellow. Cypselae (2.6-)3-4 mm, wings ± spreading, ± chartaceous, entire. 2n = 26 (+ 0-4B). Flowering (Mar-)May-Jul(-Aug). Sandy soils, ditches and roadsides, other disturbed sites; 30-500(-1000+) m; B.C., Ont. ; Ala., Ark., Fla., Ga., Ill., Ind., Kans., Ky., La., Md., Mich., Miss., Mo., N.J., N.Mex., N.Y., N.C., Ohio, Okla., Pa., S.C., Tenn., Tex., Vt., Va., W.Va., Wis. Plants that have been called Coreopsis lanceolata var. villosa Michaux often have 5+ aerial internodes 6+ cm long proximal to the first peduncle; they may merit recognition as a distinct taxon or may be hybrids (or derivatives) from crosses between C. lanceolata and C. pubescens. Infrequent in very sandy, dry soil on open dunes and knolls in the northwestern counties. The species and variety are sometimes closely associated. The species is much cultivated in gardens and doubtless our Marion County report should be considered a garden escape. It has been reported also from St. Joseph, Steuben, and Vigo Counties, where no doubt, it is native. 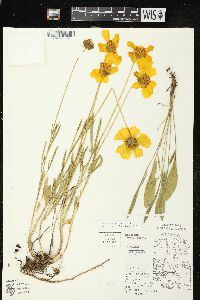 The Vigo County specimen was collected by Blatchley at Five-mile Pond. I have, however, very thoroughly botanized Steuben County without finding it; it may be a garden escape in this county. 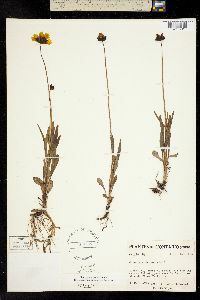 My specimens and our reports of this variety [pubescent plants known as var. villosa] are all from the few northwestern counties shown on the map. The habitat is the same as that of the species, but the variety is less frequent.